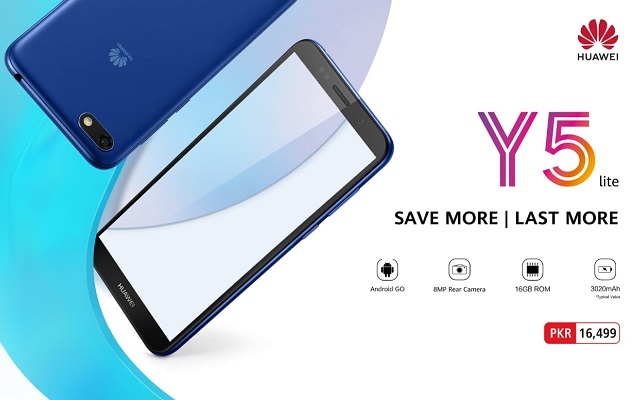 Huawei has launched its second Android Go smartphone, Y5 Lite, today. Huawei Y5 Lite is an entry-level smartphone and comes for those who can’t afford the expensive ones. However, the phone has come with good specs at a reasonable price. The Huawei Y5 Lite has a 5.45-inch IPS LCD of 1440x720px resolution. Moreover, the phone has a rear-facing 8MP f/2.0 PDAF camera and a 5MP f/2.2 fixed-focus selfie camera. Now you can take beautiful pics with these cameras. Furthermore, the Y5 Lite has 1GB of RAM and 16GB storage. However, if you want to expand the storage you can, by using a microSD card. Furthermore, the phone has a quad-core MediaTek MT6739 processor and a 3,020mAh battery with regular charging. The phone comes with Android 8.1 Oreo. Moreover, the phone will be available in Black or Blue colors. In Pakistan, the phone will be available in just PKR 16,499. The predecessor of the phone, Huawei Y5 Prime 2018 is a relatively compact handset, measuring 146.5 x 70.9 x 8.3 mm. The phone has a 5.45-inch HD+ display. Furthermore, you will get 2 GB of RAM and 16 GB of storage. However, you can expand the memory via microSD. For camera conscious users, Huawei Y5 Prime 2018 consists of a 13MP snapper on the back and a 5MP one on the front. As, Y5 Lite is a lighter version, so its specs are also low as compare to its predecessor. But, this phone is also a good option for those who want a Huawei phone at a reasonable price.